WARNING: Last time we did this workout, it seemed easy. But THEN read the comments from the next two days ... TONS of soreness. Be careful with those Aussies. Any time we do more than 50 reps in a short period of time, you run the risk of getting painfully swollen arms. If you KNOW you'll be OK - storm it! If you aren't sure - scale. We switched the SBE for squats to start the week out a little stronger with more over-all balance. If you feel you need the SBEs to counter balance the V-ups, please do the extras. The burpees (extras) will be awesome for stoking HR! Some of you will feel like you need this to kick off your week. If you want to get the same affect, but aren't up to the burpees, choose a movement that will stoke HR. It'll need to be a higher intensity movement since there is a 30s rest after each bout. Think box jumps, double unders & rowing sprints. Stay away from bar work since your low back is already going to be sore from the SBEs. Just want to throw out a quick invite to our intensive training seminar this weekend. At the seminar, we plan to cover all of the intricacies of GPP programming, nutrition and movement. Aspiring trainers will certainly learn to bridge the gap between attending a class and conducting a class, but the skills and abilities learned at the seminar transfer to all other aspects of one's health and fitness. Those who attend the seminar will learn ways of applying GPP foundational principles to themselves in a more efficient and effective manner. Course material is administered by way of both classroom instruction and hands-on small group instructional training. Know and effectively communicate GPP's landmark definition of health. 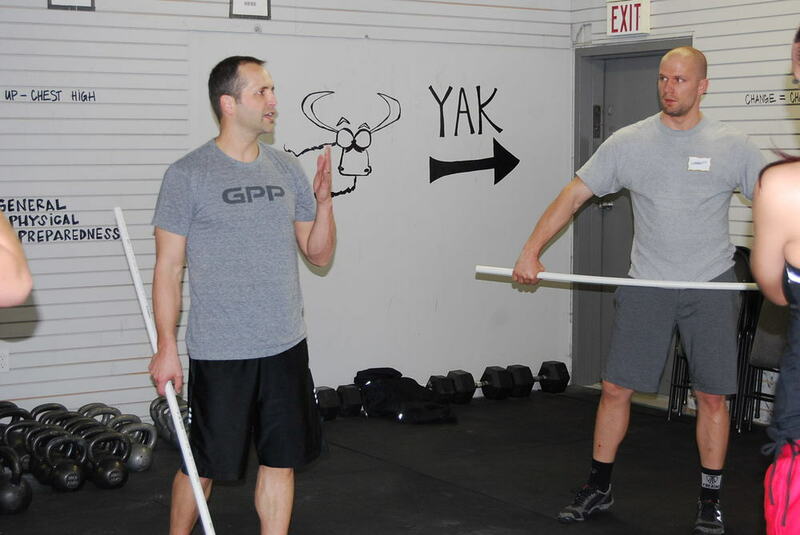 Know and effectively use and administer GPP foundational principles of fitness. Know and effectively use and administer GPP foundational movements. GPP movement philosophies and scaling guidelines. Understand corrections for common movement errors. GPP nutritional guidelines and recommendations. Attendees will be provided with knowledge to better use GPP, as well as knowledge to begin helping others become healthier and fit. We have about 4 spaces left in the seminar, if you are interested. We plan to keep this seminar VERY small compared to our others. This will create a more intimate learning atmosphere. It is also the ONLY seminar we have planned for this year due to a shift in our expansion philosophies. If you can make it, we'd be pumped to spend 1 1/2 days with you! Click HERE to register. Just a few pics of GPP Intensives!